William Wilberforce and Evangelical Continuity; J.B.
About "Let God Arise: Landmarks in Church History"
Sir Marcus Loane was formerly Anglican Archbishop of the Diocese of Sydney, the first Australian to do so and Primate of Australia. He made a significant contribution to evangelical Anglicanism as Principal of Moore Theological College and through his acclaimed biographical publications Cambridge and the Evangelical Succession; Oxford and the Evangelical Succession; Masters of the English Reformation; Three Faithful Servants and a number of series of published expository sermons. 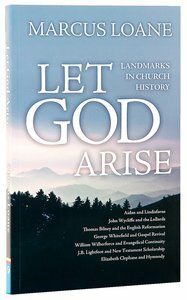 Customer Reviews For "Let God Arise: Landmarks in Church History"
I thoroughly enjoyed this concise but rich offering of Marcus Loane's. It will reward anyone seeking to be uplifted by the testimonies of saints of the past. It will also inform readers with its wealth of information written in a style of unaffected learning. For example, the extraordinary contribution of Thomas Bilney to the English Reformation is treated with a lovely blend of historical narrative and devotional poetry. The insights in the chapter on J.B. Lightfoot are touching: the great scholar who laid aside his studies to care for his diocese and train young men for the ministry. There is so much that could be commented upon. I recommend it most highly.